Ahhhh... model stitching. This has cheered me up immensely and reminded me exactly why I wanted to design. One of the greatest joys as a designer is seeing it all come together. You spend hours on the computer, drawing, twisting and turning motifs. Then you spend hours with thread and fabric samples test stitching and picking out what you hope will be the ultimate colour combination. Finally, the day arrives. Fabric and model threads arrive in the mailbox, and what was once only in your imagination starts to take on a life of it's own. You can finally stop wondering, "did I pick the right blue? Is that green going to be too dark?" What is especially wonderful, is when the colours are even better than you'd hoped, and the fabric sets them off so perfectly that it surpasses anything you could have imagined. It was a tough decision picking which would come first, but because it was the first design in the series that I completed on the computer and the first one I picked out threads for, AND because the Summer Sky from Gloriana was just so spectacular and screamed "stitch with me!!" I decided to start the series with Forget Me Not. 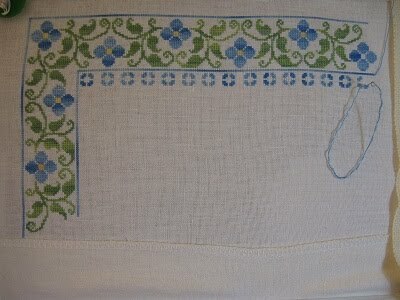 It is being stitched on 40ct Magnolia from Lakeside linen, using Summer Sky, Narcissus and Leaf Green. I figured while I had the camera out, it would be a good time to update all those WIP and finishes that I drone on about but never show you. The finish... I think this is the only recent one I've not yet posted a picture of. 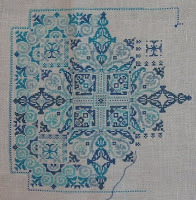 This is Jardin D'Jour from Needlemania (with a little help from Diane Jourdan of Sampler Cove). 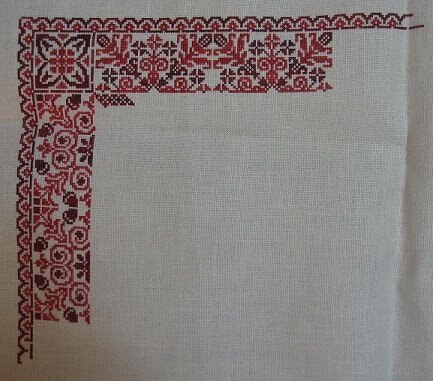 It is stitched on 40ct linen from Hand Dyed Fibers in the natural white colour, using Hand Dyed Fibers BePopped and BeMused, which are lovely together. It looks a bit squished, and that's because the fabric is NOT an evenweave. In one direction it appears to be 38ct, in the other it's more like 42ct. 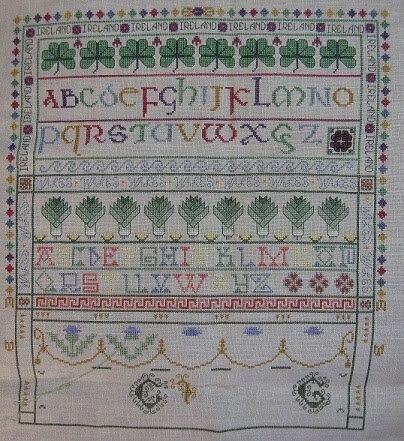 English Whitework Sampler is from Needle's Prayse. 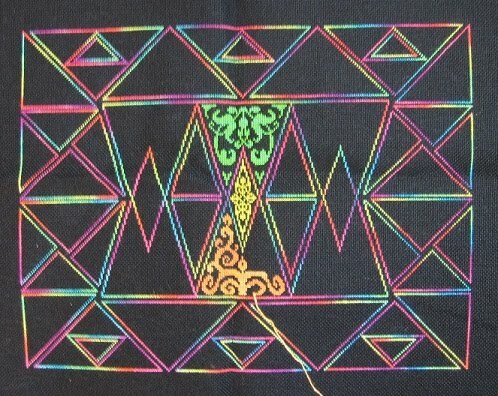 I love this design, and so far it's been a fun stitch. Not a cross stitch in sight, so it's a nice change from everything else I'm working on. I'm stitching it on 40 ct Ivory Ricamo linen, which was probably a bit of a faux pas, since the linen is very dense and hard to pull, but it is turning out lovely. I'm using Hand Dyed Fibers Perle #12 and Premium weight threads in Examplar White Chocolate. I wanted something with a little more depth than solid cream. It's a little hard to see since it's tone on tone, but the textures are lovely in it. And of course since my rotation never includes only one Sampler Cove design, here is Enya. 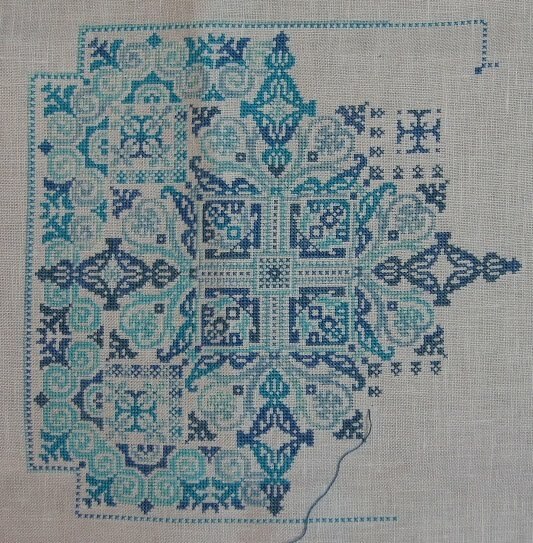 This little beauty is stitched on 45ct white Florence linen using Waterlilies Mediterranean and Azure Skies. 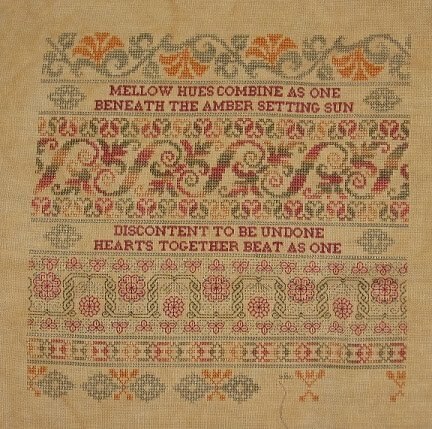 While I love how the Waterlilies stitch up, I do have one complaint that I really found apparent in these two colours. The colour repeats are much too long. One complete cycle of variegation is over 1 yard long. So you have a choice, you can cut multiple strands and work from more than one at a time, or you can work with one very long strand, or as I did, you can work with your normal 18" length and just be happy with the colours not balancing out perfectly. I'm still very happy with how this is turning out, but I would have liked better it if the colours flowed into one another more frequently. I do have one other Sampler Cove I've worked on recently, but I didn't finish much of it before I switched it out. 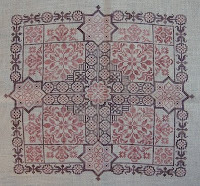 This is Tuscan Rose, which is stitched on Sassy's 40ct Hayfields, dyed on Ricamo linen using Hand Dyed Fibers threads. I find lately I can't work on this one for long stretches like the others. This batch of threads is very odd. I have older threads from before the switch that are lovely to use. I have threads that were produced in the interim while Vikki was deciding on a manufacturer and getting them perfected which are nice as well. And I have recent threads which are wonderful too. These, on the other hand, are extremely thin, moreso than any others I have gotten. And they just won't flatten out on the fabric - even on this fabric, which after washing is more like a 44 ct, they don't give very good coverage. And for some strange reason, they insist on twisting back upon themselves constantly, causing them to knot and fray and causing me to gnash my teeth and swear. It is lovely though, and I'll finish it eventually because it's too pretty not to. In the same category as Tuscan Rose is Rosewood Manor's Great British Sampler. It's beautiful and I love how it's turning out. But again, the threads are strange, just like those above. Not surprising since they were all ordered around the same time. 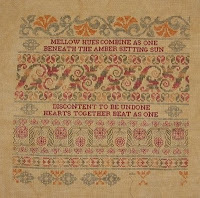 Anyway, this one is also stitched using HDF, on Lakeside 40ct Chantilly Cream. While I do love this design, the colour use isn't very effective. 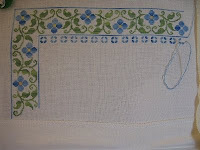 There are lots of places where a colour is only used for a couple of stitches, and could just as easily have been done in another colour which is used more. 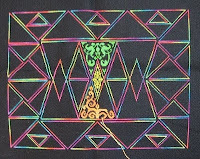 And there is a bit of confetti and fractionals and backstitch, but it will all be worth it in the end because it is a wonderful design. 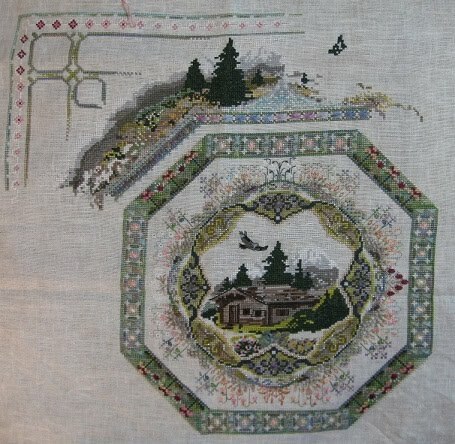 And I did some work on Alpine Garden, which I'm stitching in the called for colours (for the most part) on 35 ct HDF linen. I love how this one is turning out. 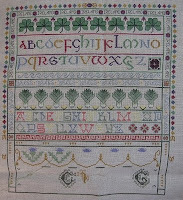 It's been a bit of a challenge for me, the chart isn't the greatest to read - a lot of symbols which are very similar to one another and no grid count along the edges, and some issues I had with the backstitch sections have made this less than fun at times. But all in all, I'm extremely happy with it. It stitches up much quicker than you'd expect for the size of it. And finally, I don't know if I ever did post a picture of this so here it is, Ink Circles Cirques des Triangles. 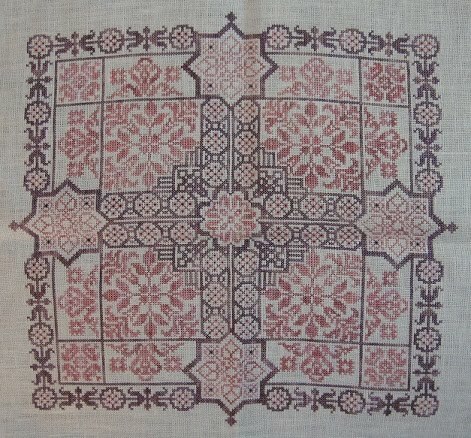 I'm stitching this one in an assortment of Gloriana silks, over one on 28 ct black (obviously) jobelan. It's such a fun design, and it's so a joy to stitch something so bright and cheerful. :) And I do so love over one on 28ct. Having an absolute blast with this design. And just one tiny vent today. It's Friday the 13th and I live in Port Dover. If that doesn't mean anything to you, I shall explain briefly. Every Friday the 13th, our town is invaded by bikers from across North America. I think the last time we had one in summer was in 2008, and we had well over 100,000 people in town. I heard on the radio this morning that they were expecting closer to 200,000 this year. That's a lot of people for a little town like this. The webcam view of downtown looks like a sardine can already and it's not even noon. While this is wonderful for the town and the local businesses (the ones who stay open anyway), it really isn't much fun for residents. We get to spend about four days (from Thursday to Sunday) sleep deprived due to the constant drone of bikes, all of which have had their mufflers removed to make them louder, the all night parties and loud music... Add in to that the fact that we can't actually get around ourselves, because they close half the roads to cars and if you do need to go anywhere - like a job! - you have to have a special pass to get through and still can only take certain routes which are backed up for miles with traffic. It is fun, I will admit, to go for a wander through town and see all the neat bikes and mingle with thousands of people, but after the dozen or so I've attended, it's now sort of a been there, done that attitude I have towards it and I'm praying for Monday to arrive soon. Oh my goodness, all of your projects are just beautiful! Thanks for sharing them and inspiring me to make sure I put a few stitches into a project this weekend. i had so many rapid intakes of breath from all the pretties that i hyperventilated..
i LOVE Gloriana's Summer Sky it is one of my fav silks, it was the perfect choice for forget me nots..
Awww, thank you ladies!! Glad to know I'm inspiring some stitching!